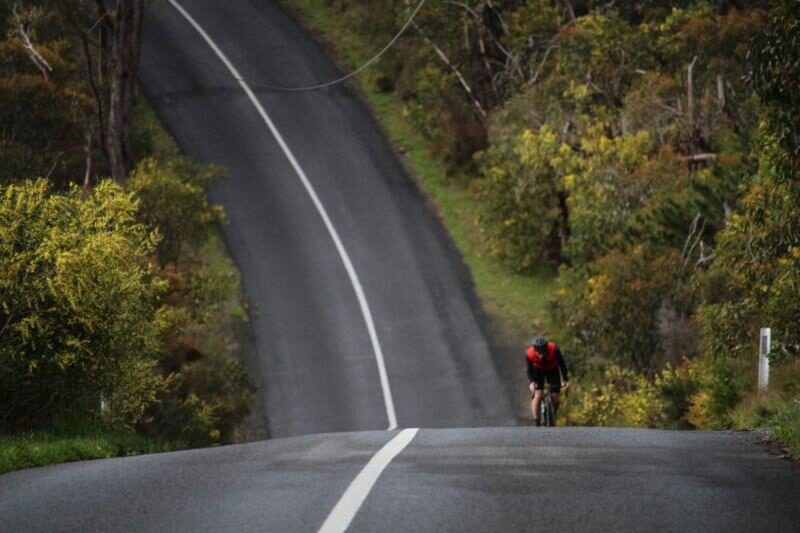 Last Saturday saw a group everesting attempt on Yarrabee road. The weather was absolutely perfect with 3 riders starting just after 4.00am and others joining around an hour later. The first to finish was Justin Dunn who started the day before due to commitments, riding through the night solo. Other finishers were Christopher Sutter, Paul Briggs, David Rossi (+HRS), Rob Knight (+HRS), and Shane Elliott (+HRS). I wasn’t there for reasons you’ll see below, but chapeau to the everesters and HRSers, as well as the Sherpas and crew assisting on the day. Loving this time of the year when Mother Nature gives us glimpses of what is in store for us over the next 2 – 3 months. Last Saturday was one of those days. A forecast of 20 degrees C was a promise of something delightful, so I decided to take full advantage and go on my longest ride since last summer/autumn. My plan was for a meandering ride up to Strathalbyn, but how I was going to get there and what I did to get back to Adelaide was pretty much open on a whim. All I knew was I would ride up Greenhill, hit Strathalbyn and finish back in Adelaide. The beauty of the Adelaide Hills is that with small climbs and a great network of criss-crossing country roads you can get to wherever you want my many different routes. Climbing up Greenhill gave me ample time to change my mind 3 or 4 times, and I eventually settled on Balhannah, Hahndorf, Echunga, Strath. Some of Adelaide’s finest rolling hills, nothing too challenging, just an opportunity to revel in some grand scenery. The road leading into Hahndorf from Balhannah is an absolute beauty with the Adelaide Hills Vineyards opening up before your eyes. These things are pure evil. They don’t look it, but don’t trust them. Coming into Strathalbyn had me contemplating my route options, with the wrap around through Paris Creek to Meadows and then back to Adelaide high on the list. I hadn’t been along Paris Creek road for a long long time, and the Meadows bakery was tempting. However, at the back of my mind was a route that had me heading North across the flatlands and picking up Callington and Kanmantoo before heading back west towards Adelaide. You know Kanmantoo is not far away when you see the red sands of the eroded creekbeds. Riding across the flatlands I had my rehydration stop at Kanmantoo all planned out, in fact I was so sure they would be a Balfours deli that I had almost built myself up into a frenzy with the thought of a custard tart and was bitterly disappointed when they didn’t have any, so had to make do with a bag of lollies as a relief from the gels. The rolling ascent back up into Nairne is one of Adelaide’s better but unsung climbs. Starting off with a flat road that slowly starts to build up, in parts up to around 7.5%. Not steep, but enough to get a good rhythm going. This time of the year the hills are a brilliant green, the gums are old and grand, the hills a re rolling without being excessively steep, and the traffic not too bad. I took a call from Mrs Wednesday Legs as I was passing the Inverbrackie Army Barracks outside Woodside and made a rendezvous to meet at the Uraidla Bakery for a lunch and a coffee. The climb back up Greenhill Road from Balhannah is a long steady climb which is not a nasty, but after 110km after winter it is rather gruelling. Fortunately the pork sausage roll at cool water at Uraidla was a blessing. Leaving the bakery I actually felt quite good, even stopping for one last photo shoot at one of the vineyards in Summertown. I certainly no grape grower, but some of those vines look like they have some years behind them. The unfortunate thing was that I was so looking forward to the descent back down Greenhill that I forgot about the everesting on Yarabee Road. Sorry guys. Its hard to believe the Vuelta only finished just over a week ago, with an absolutely stupendous result for the Australian team Mitchelton Scott, a first time Grand Tour win with Simon Yates showing amazing strength in the last week. Here’s a reminder of the last week and a bit at the Vuelta. Oh, and in case you’re wondering, that hat above is a traditional Asturias hat. Asturians are the native ethnic group of the autonomous community of Principality of Asturias, in Spain, as well as smaller communities in the Spanish provinces of León, Zamora and Cantabria. The time has come for that stalwart of Australian Cycling, Mathew Hayman. But, having said that there is one person, or family, that needs to be mentioned. This man and his generosity have changed the sport of cycling in Australia. Gerry Ryan and the Ryan family have made it normal for there to be a team that Australians can call their own on the world stage. But more than that, I think his generosity to the sport has made it a fact that there is a pathway for any young Australian boy or girl who dreams of riding and winning the biggest races in the world, not only in this team but across the sport. To be an athlete at this level you have to be self centred, selfish, driven, hungry (literally and figuratively) and spend most of your life tired. I look forward to freshening up and giving back to my biggest fans, the fans who don’t watch me race, couldn’t care less about my results, Harper, Noah and Elodie. Kym, my wife, has always been there for me behind the scenes, the longevity of my career can be attributed to her support of me and our family. If she’s taught me anything in all our years together, it’s to leave before the party goes bad. Chapeau Mathew, a great cycling career providing some superb on road guidance to a fledgling cycling team that has all of a sudden grown up. Amanda Spratt will lead the elite women’s squad which includes Grace Brown, Brodie Chapman, Tiffany Cromwell, Shara Gillow, Lucy Kennedy, and Sarah Roy. Nick Schultz has been called in as the replacement for a sick Richie Porte for the World Championship road race. Michael Matthews was again overlooked for the Australian team. Porte ruled himself out of next Sunday’s event. Nick Schultz, 24, has spent the last two seasons with the Spanish Pro Continental team Caja Rural-Seguros RGA, but has recently signed a two year-contract with Mitchelton-Scott, starting next season. Nick joins Rohan Dennis, Simon Clarke, Jack Haig, Chris Hamilton, Damien Howson, Robert Power and Rory Sutherland. Who do the bookies think will win? The 2018 UCI Road World Championships in Innsbruck, Austria kicked off last weekend, and continues through to this weekend. SBS coverage started Monday 24 September. The main events are covered on SBS free to air as follows – the women’s (Sat 29 Sep 2000 AEST, on Viceland from 2255) and men’s (Sun 30 Sep 1730 AEST, on Viceland from 2305) road races. Team Sky’s budget for 2017 was £34,496,000, up 11% on the previous year as the screengrab from their filed accounts shows. It was equivalent to US$46.2 million or AUS$64 million. Just Wow! The team makes no real profit, the surplus generated is equal to the tax bill due. The team’s principal sponsor, Sky, is the subject of takeovers in London and New York. US telecoms and media company Comcast is battling 21st Century Fox to takeover Sky on the London Stock Exchange. Meanwhile Disney is trying to acquire 21st Century Fox too. This presents two ultimate scenarios: Comcast owns Sky or Disney owns Sky. In both cases a slew of media reports say James Murdoch, the biggest backer of the pro team, is leaving. For all the Wall Street reporting there’s no detail on the fate of the cycling team sponsorship, just a story to watch. You guys are just awesome, only $1,834 to go till reach my target. Please keep up the great work, and if you like what you have been reading with this blog, please give generously.